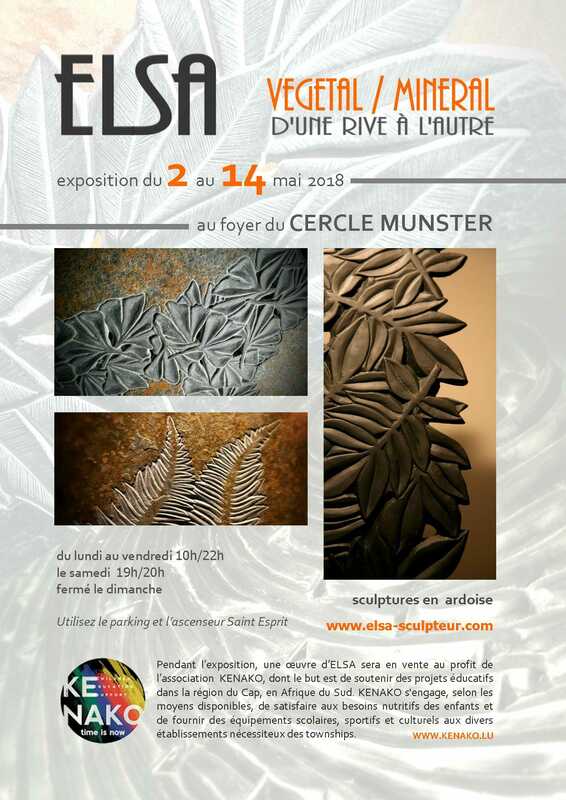 2-14/5/18 : Exibition by Elsa-sculteur at Cercle Münster in Luxembourg. 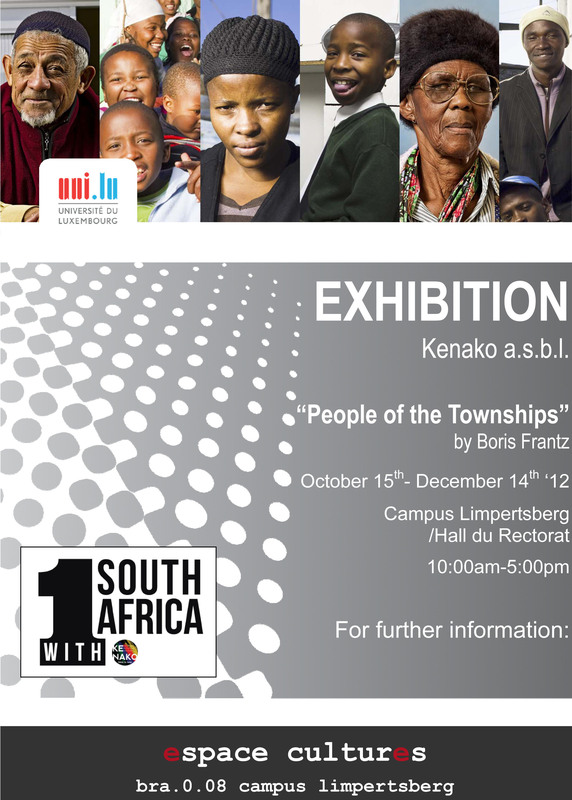 The art piece called "Protea" will be sold for benefit of KeNako asbl. 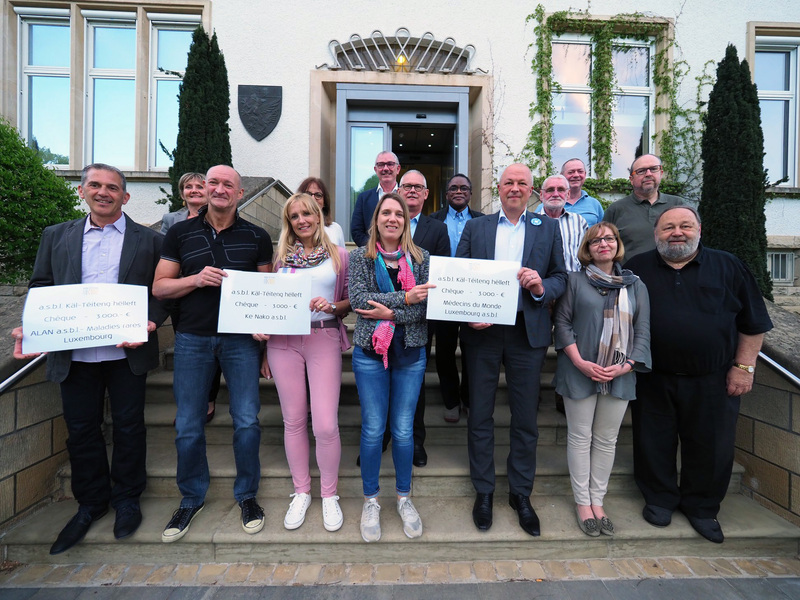 - 23/04/2018 : Donation of 3000.-€ from Asbl. 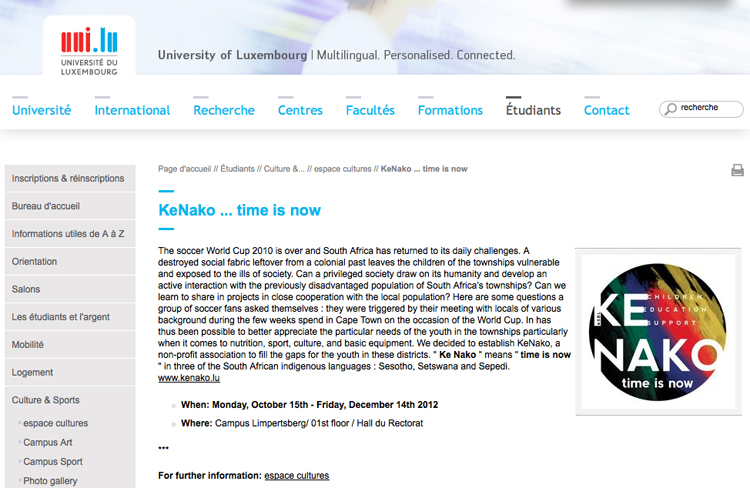 Kayl/Téiteng Hëlleft, handed over to our representatives Renée & Daniel Leiner during the ceremonie in Kayl. 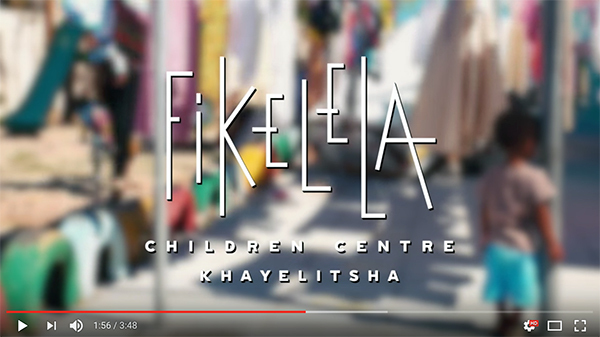 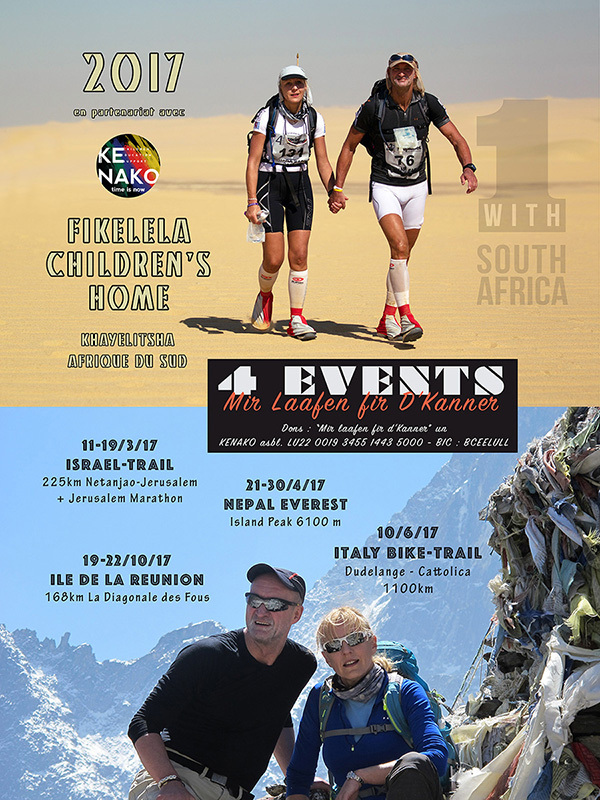 - 22/10/2017 Fund Raising Project RUN4KIDS "4 EVENTS - Mir laafen fir d'Kanner", an initiative by Renée & Daniel Leiner to raise funds for the kids of Fikelela Children's Home. 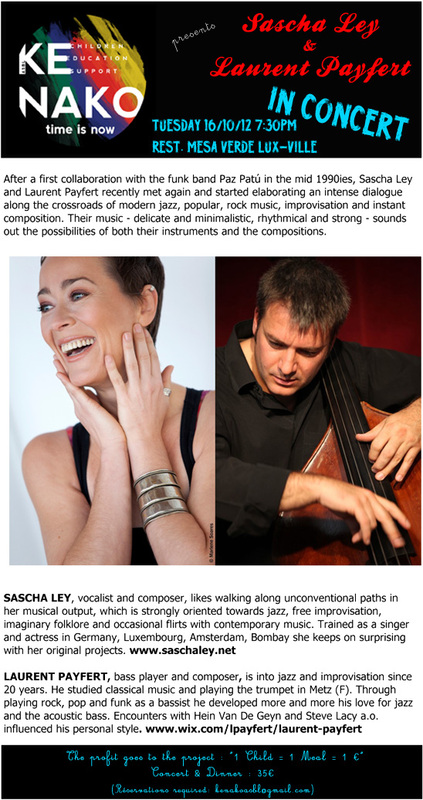 Each stage has been performed with brio !!! 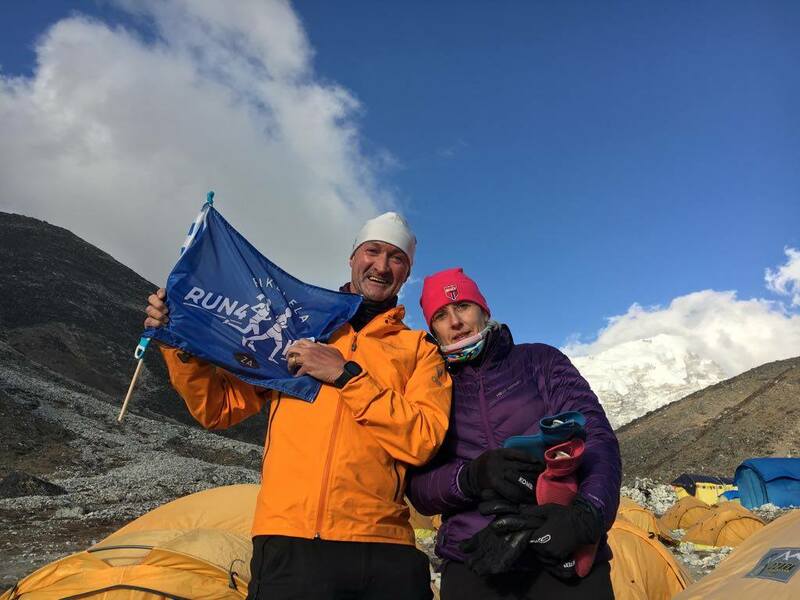 - 22/10/17 : Fund raising events : RUN4KIDS Challenge n°4 : Run the most difficult race at Ile de la Réunion (France) the "La Diagonale des Fous". 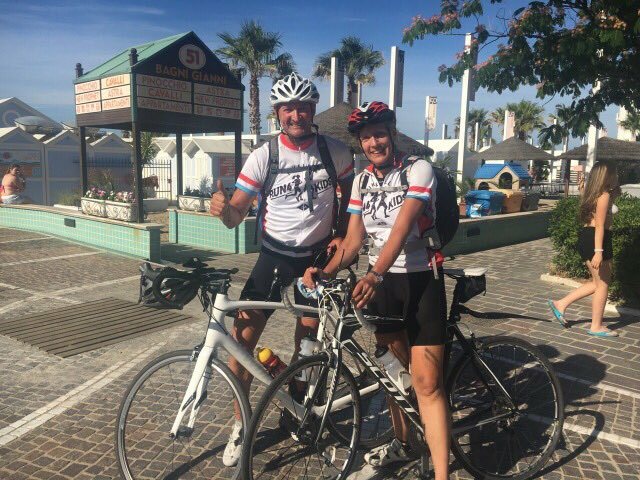 168km in one stage. 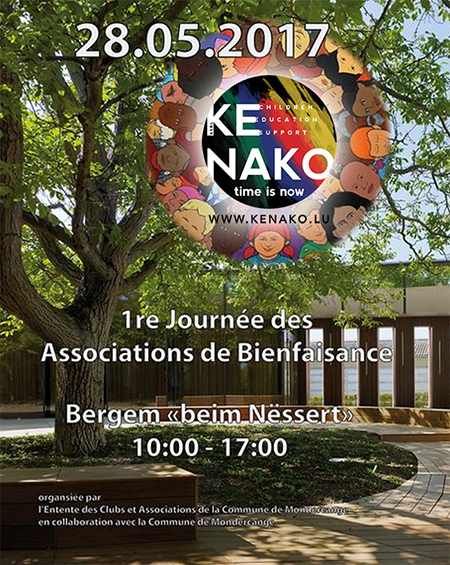 - 28/05/2017 : First "Journée des Associations de Bienfaisance" organized in Bergem at the Culturel Centre "Beim Nëssert" with the participation of KeNako asbl. 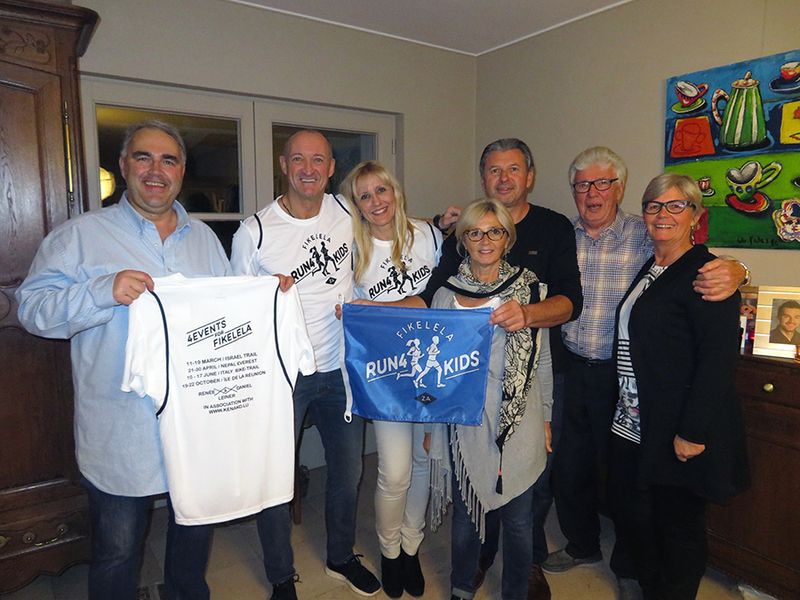 - 10/03/2017 : Just in time before the first challenge : the new sport-shirts handed over in Schengen to Renée & Daniel Leiner, in presence of KeNako board members. 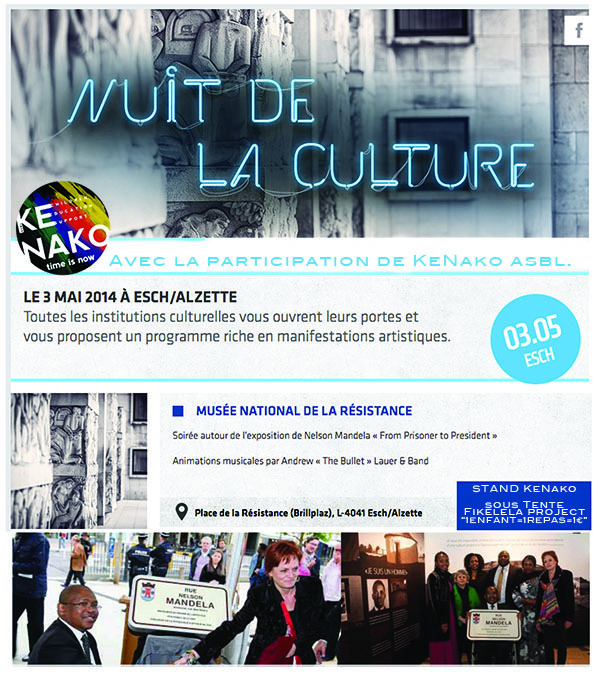 - 3 & 16-17 MAI 2014 : Esch-sur-Alzette, Luxembourg, Musée de la résistance, participation at the Nelson Mandela exhibition "From prisoner to president"
- 28 APRIL 2014 : Luxembourg, donation of 2000€ by "Lions CLub Luxembourg Amitié"
- 17/12/2013 : Kehlen - Luxembourg, donation of 2000€ by "Maison de relais" Kehlen. 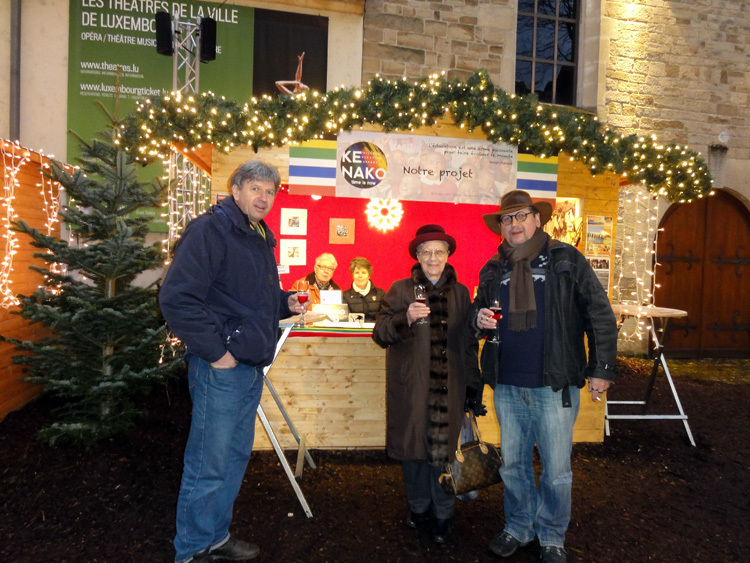 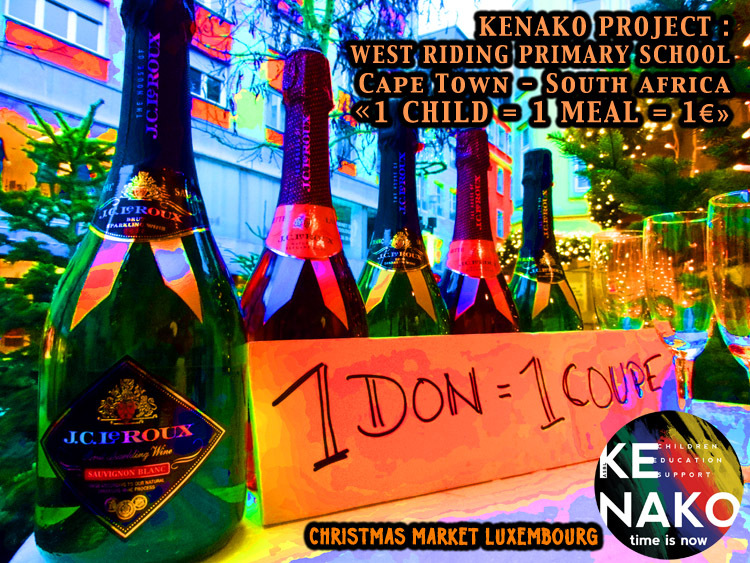 - 10-16/12/2012 : Participation at the Christmas market in Luxembourg town (rue des Capucins - in front of the theater) from 10am to 6pm. 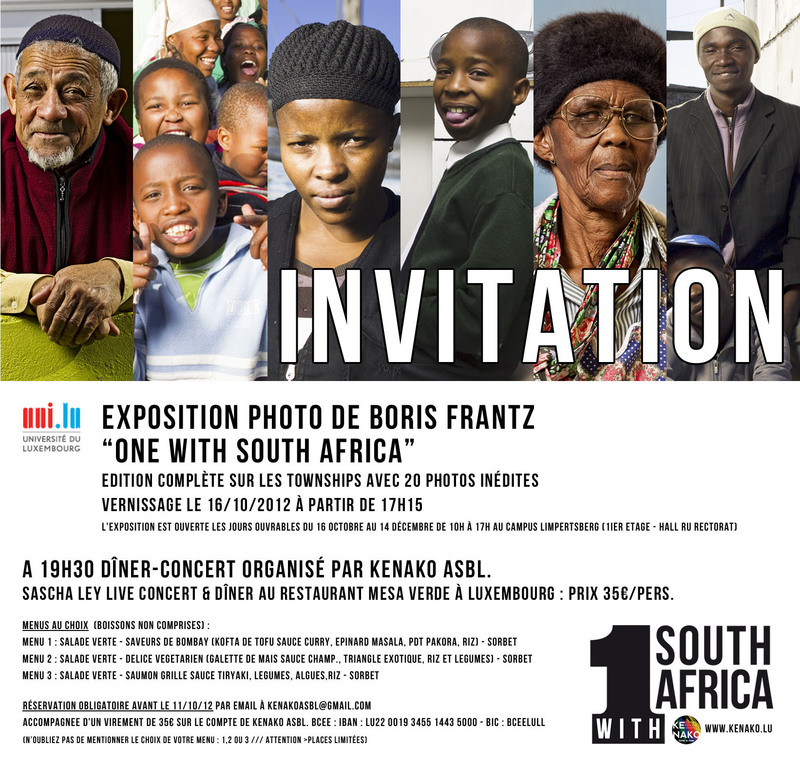 7/10/2012 : Participation at "Konscht am Gronn" (Art exhibition) at the Abbaye de Neumünster Luxembourg-Grund > Hall Agora from 10am - 6pm. 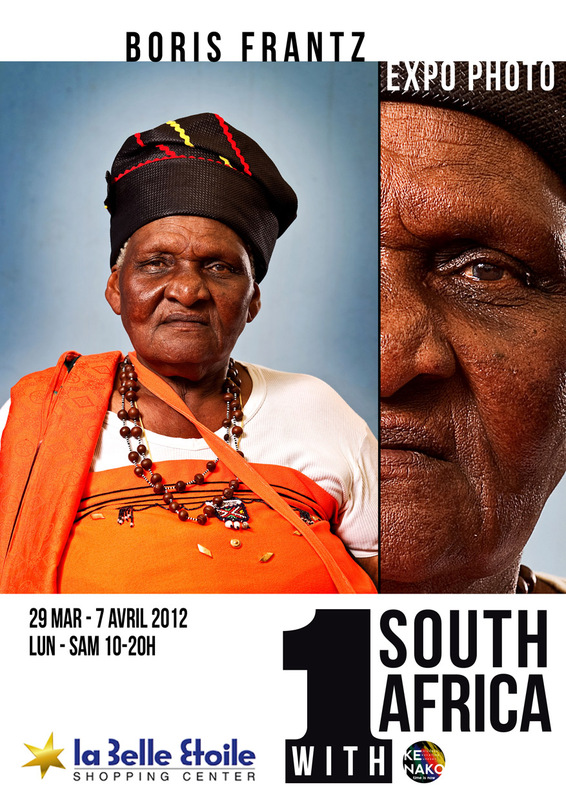 39 participants. 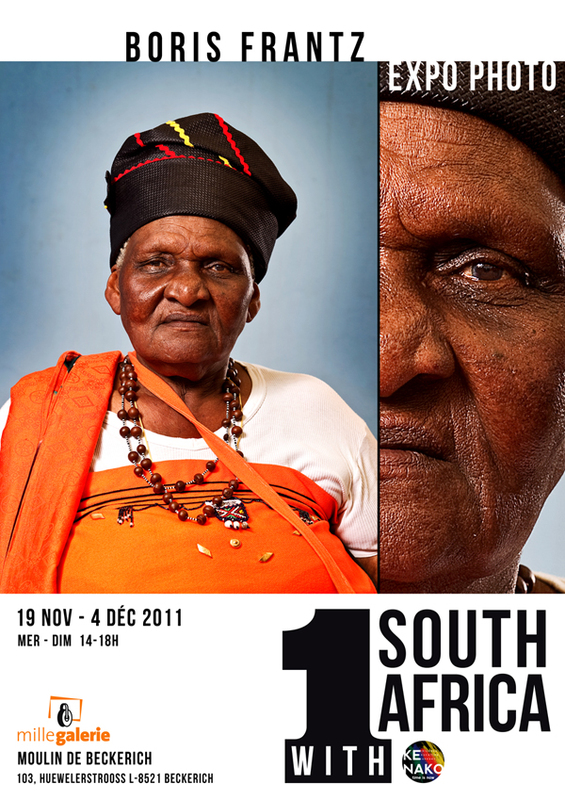 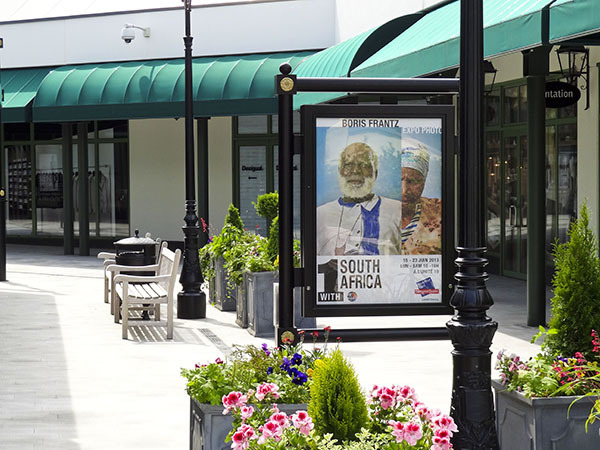 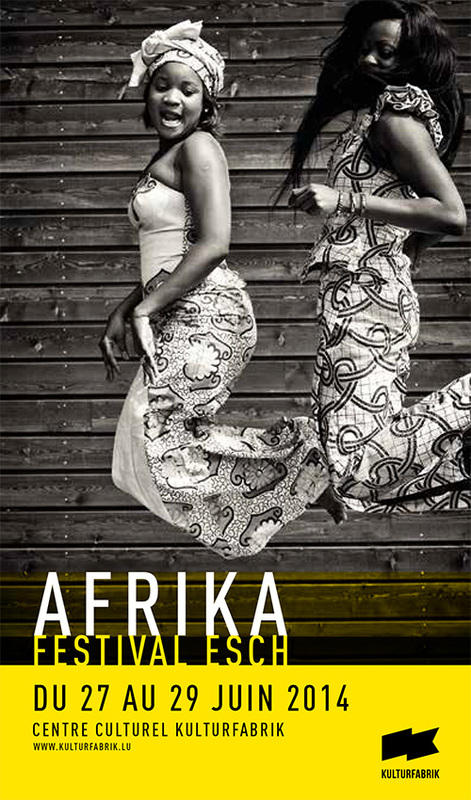 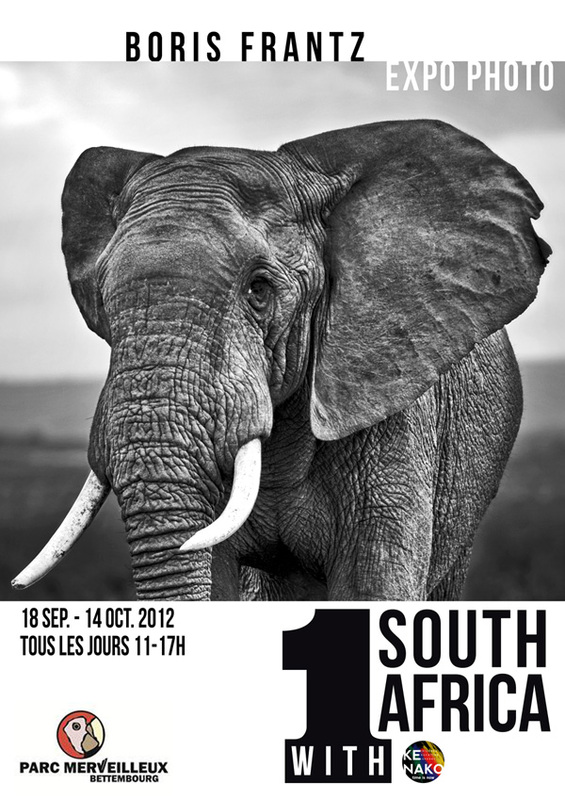 17/09 au 14/10/2012 : Parc Merveilleux in Bettembourg, Luxembourg - Photo exhibition "One with South Africa - Animal Part" by Boris Frantz.